Sign up for Broadjam today to follow Darien Martus, and be notified when they upload new stuff or update their news! 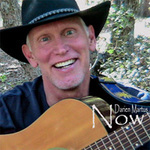 Darien Martus sings and plays his original songs. The lyrics explore love, philosophy, personal adventures as well as the political scene. ?I just wanted to sing my song? ?You can?t cut me out tonight? But they said, ?You talk funny? ?I guess I?ll dance on the other side? When will sounds come up from the ether? When will I know which words to write? When?s the chance for us all to find peace somehow? When will music rise from the silence? When will my ears open at last? When can voices blend in a perfect sound? When will gifts come, one, then another? When will I be free to let go? When?s the day there?s enough of it to go ?round? When will beauty swell from the darkness? When will my eyes see what is there? When can lovers share any truth they?ve found? Hey, can I take anymore? When?s the moment of truth? When?s the day of decision? And the point of creation? When does life pour out in a torrent? When do I have news I must shout? When?s the time for us all to pull back the shroud?